Rijd een deel van de weg langs de oude Appian Way-weg zonder verloren te raken tijdens deze fietstocht. Je zult eeuwen geschiedenis passeren terwijl je door het Romeinse platteland fietst op de route die dateert uit de vijfde eeuw vGT. Uw ervaren gids toont u bekende en minder bekende sites langs de route en zorgt ervoor dat u genoeg rust- en fotostops hebt voor een aangenaam en actief dagje uit. We LOVED this bike trip. We were fortunate to be the only ones on the tour. Our guide was excellent and the trip was fantastic. It was great to get outside the city and the tour was fascinating. We saw many great spots on the back roads of Rome. You don't have to be an avid rider to manage this trip. If I were just to rate the actual experience it would be a 5. The bike ride along the Appian trail and all of the stops along the way were incredible. 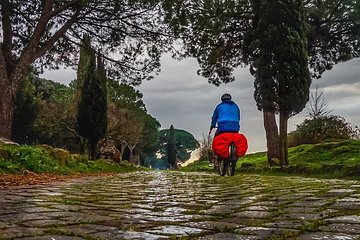 The history of the trails, the stop into the catacombs, the mausoleums along the route and lovely ride into the countryside to the aqueducts was a highlight of our Rome trip. It was so good to get out of the city for the day. However, from an organizational point of view Id give it a 3. Our guide was 45 minutes late, the bike shop we were told to go to had no idea what was going on and didnt have electric bikes, which is how the tour was marketed. We had to ride over to the main shop to get three electric bikes. Also, our guide,albeit knowledgeable, had a thick Russian accent and spoke incredibly fast which made it difficult to understand the facts and figures. We also werent given helmets which was fine - but some of the routes along the busy streets and narrow paths are crazy for the inexperienced rider.